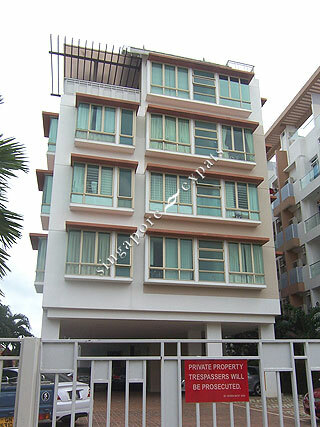 GRAND RESIDENCE is located at 54 LORONG G TELOK KURAU in district 15 (Katong, Siglap, Tanjong Rhu) of Singapore. GRAND RESIDENCE is a Freehold Condo development consisting of 12 units. GRAND RESIDENCE is completed / TOP in 2006 (estimated), developed by TEAMBUILD DEVELOPMENT (S) PTE LTD.
Educational institutions like GLOBAL INDIAN INTERNATIONAL SCHOOL (EAST COAST), ROSEMOUNT KINDERGARTEN, ROSEMOUNT INTERNATIONAL SCHOOL, ST. STEPHEN'S SCHOOL, HAIG GIRLS' SCHOOL and EUNOS PRIMARY SCHOOL are near to GRAND RESIDENCE. GRAND RESIDENCE is accessible via nearby KEMBANGAN, EUNOS and PAYA LEBAR MRT Stations. Had rented room in Grand Residence for more than 3 years. Flatmates are friendly. Nice landlord though not staying there. Very convenient location. Quiet and peaceful. Highly recommended.